The Cleveland Cavaliers selected LeBron James with the first overall pick in the 2003 NBA Draft. James entered the draft right out of High School in ’03. The Akron native has gone on to become one of the best basketball players of all time. James won Rookie of the Year honors after averaging 20.9 points, 5.5 rebounds and 5.9 rebounds during the 2003-04 season. James was also named to the league’s All-Rookie First Team. James was just one of several future stars taken in the 2003 NBA Draft. With the second overall pick in the 2003 NBA Draft, the Detroit Pistons gambled on center Darko Miličić. The next three picks produced perennial All-Stars. At number three, the Denver Nuggets selected Syracuse forward Carmelo Anthony. With the fourth pick, the Toronto Raptors took Chris Bosh. The Miami Heat selected Marquette guard Dwyane Wade to round out the top five. Other notable players selected in the first round of the 2003 NBA Draft include Nick Collison, David West, Sasha Pavlovic, Dahntay Jones, Boris Diaw, Kendrick Perkins, Leandro Barbosa and Josh Howard. 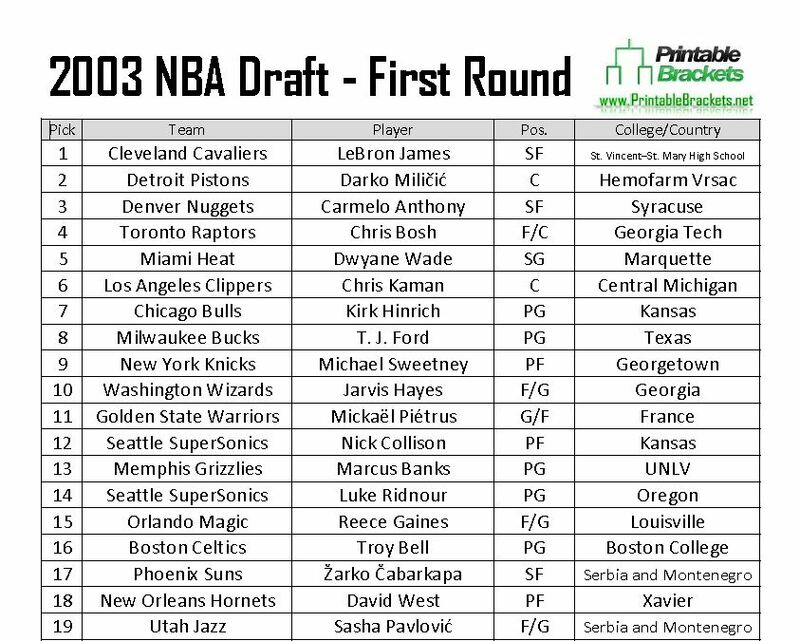 Notable players who came off the board in the second round of the 2003 NBA Draft include Steve Blake, Zaza Pachulia, Matt Bonner, Mo Williams, James Jones and Kyle Korver. Along with James, Anthony, Bosh, Wade and Hinrich were named to the All-Rookie Team. The 2003 NBA Draft is widely regarded as being one of the best draft classes of all time. James would later infamously join forces with Wade and Bosh in Miami in 2010. Anthony was later traded to the Knicks.